The Cartier Santos 100 was the world's first wristwatch for pilots. 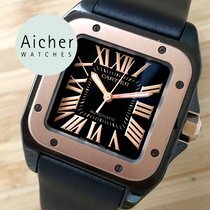 At 41 x 51 mm, this square luxury watch is a rather distinct accessory. Its most important features include the eight screws on the bezel and Roman numerals on the dial. The Cartier Santos 100 is a celebration of over 100 years of history. Cartier presented this new edition of the Santos in 2004, exactly 100 years after the first generation of the watch went down in watchmaking history. The Santos was the first pilot's wristwatch worldwide. The new 100 model stands out due to its size: It measures 41 x 51 mm, meeting the desire for larger timepieces. It also features eight distinctive screws on its bezel and Roman numeral hour markers, a combination of classic and modern design elements. Cartier designed the square Santos for the Brazilian aviation pioneer Alberto Santos-Dumont, a vibrant personality at the beginning of the 20th century. He stunned Parisians with his airships and other aircraft. Pocket watches were still the norm at the time, and as a pilot, Dumont found them very impractical. In order to read the time while in the aircraft, he always had to take his hand off the steering wheel. Therefore, he desired a wristwatch that he could wear while flying. Cartier made his dream come true with the Santos in 1904. Two years later, Dumont wore the watch during the first official public motorized flight. How much does a Santos 100 cost? On your wrist, it has the effect of a round watch with a 42-mm diameter, making it one of the larger luxury watches of its kind. A pre-owned model in good or very good condition costs around 3,300 USD. New models cost around 5,300 USD. If you want a version with a chronograph function, then the Santos 100 Chronograph XL is a good choice. Models with a rose gold case and textile strap combine elegance with the sporty character of a stopwatch. The black dial and rose gold Roman numerals and subdials perfectly round off the entire look. Unworn, this version of the Santos 100 Chronograph XL sells for about 23,400 USD. The standard size for the Santos is about 45 x 35 mm. A pre-owned yellow gold version costs around 11,700 USD. New, it costs almost 18,700 USD. Classic models in the Santos 100 series display the time on a white or black dial. There are also variants with mother-of-pearl, gray, or brown dials. For example, the XL version in rose gold with a brown dial and a matching brown leather strap demands around 14,000 USD. The Santos 100 is also available as a women's watch. These versions are slightly smaller than the men's watches, and some feature diamond-set bezels and leather straps in more traditionally feminine colors. 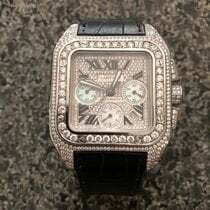 Stainless steel models sized 44 x 36 mm cost around 4,100 USD pre-owned. New, they cost about 1,200 USD more. 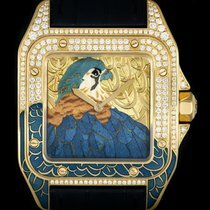 New versions with a solid gold bezel cost around 7,400 USD; pre-owned, they cost around 5,000 USD. 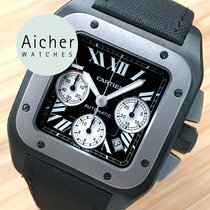 The Cartier Santos 100 Carbon is a state-of-the-art watch. It has a black-coated steel case, making the watch reminiscent of jet planes like the Lockheed SR-71, better known as the "Blackbird." This strategic reconnaissance aircraft was used by the US Air Force between 1966 and 1998. With a maximum speed of over 3,500 km/h (2,174 mph), it was one of the fastest planes that could start and land on its own. The Swiss manufacturer Breitling offers a model in their Avenger collection called Blackbird, which also has a black-coated case. The black ADLC coating of the Santos 100 Carbon is amorphous diamond-like carbon. Therefore, it shares some characteristics with the precious stone: Its coating is especially hard as well as scratch and shock resistant. It has a metallic black look. The crown is polygonal and has a synthetic, faceted spinel. The dial is black and Roman numerals serve as hour markers. The central second hand is red, which makes it stand out against the otherwise black and white design. The steel sword hands are coated with a luminous material, and sapphire glass protects the hands and dial from outside influences. A triple folding clasp keeps the calf-leather strap securely on your wrist. A new Santos 100 Carbon costs around 7,000 USD, while those in very good condition start around 6,700 USD. 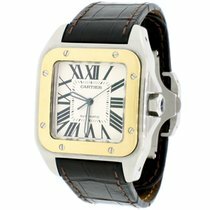 The in-house caliber 1847 MC powers the Cartier Santos 100. It's named after the founding year of the company, 1847. The automatic movement has a power reserve of 42 hours, a balance frequency of 28,800 alternations per hour (A/h), and a balance stop, which allows you to set the watch to the exact second. Thanks to the fast barrel, the watch runs evenly and precisely. The rotor winds the mainspring bidirectionally. One highlight of the Santos 100 collection is the skeletonized model. Cartier forwent a classic dial on this timepiece, instead using the movement's bridges to form large Roman numerals as hour markers. The case of the Santos 100 Skeleton Watch is made of palladium 950. The crown is set with a faceted sapphire, and the sword hands are made of tempered steel. A black alligator leather strap with an 18-karat white gold buckle keeps the watch on your wrist. You can get this skeletonized luxury watch for about 35,100 USD in very good condition and 70,200 USD new. The skeletonized Santos 100 is powered by the in-house manual movement 9611 MC. The caliber has a power reserve of 72 hours, which is equal to three days. The movement is individually numbered and made of 138 pieces. It is visible from both sides of the watch through clear sapphire glass. The luxury manufacturer Cartier is most well known for jewelry. After founding a Parisian jewelry store in 1847, the focal point of the business became selling jewels, rings, necklaces, and other precious items. The first watches were added to the collection around ten years later. Over the years, the family business expanded its watch selection and even developed into a watchmaking pioneer . Cartier designed unique case shapes for the Tank (rectangular), the Baignoire (oval), and the Crash, which has a shape reminiscent of the melting clocks in Salvador Dali's artwork.